Are you obsessive about your web stats? All businesses know that it's vital to monitor how many people have visited their site; and for the rest of us, this info just strokes – or destroys – our ego. 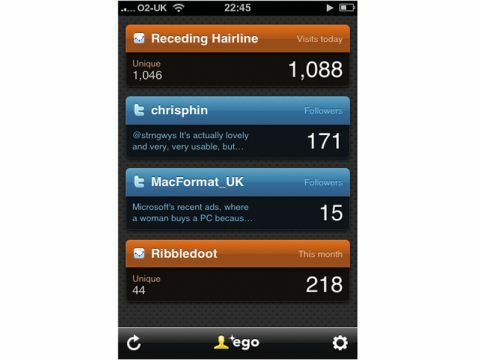 Either way, Ego aims to show these figures on a single, login-free screen. It supports Google Analytics and Mint, and can report RSS subscriber numbers that are fed through the FeedBurner engine. The data's not that granular (tap the module to cycle between visits today, this week, this month and this year) and it would have been good to tap a button to launch us into the tracking site proper. However, it's still a handy app and has been built in such a way that the developer can add support for other sites.